Your visit to our offices will be brief, and we believe an enjoyable one, too. You will be greeted by one of our friendly optometric assistants who will ask you to complete a brief questionnaire that will help us understand your medical and family history. 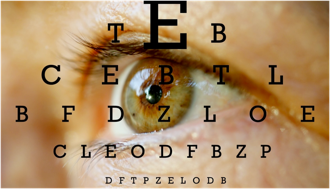 The optometric assistant will then guide you through a set of preliminary tests that will determine your visual acuity, color discrimination and tests designed to see how your eyes work together and line up. You will also be tested with a visual field machine which will provide Dr. Blumberg with a print out of how your retina responds to stimulation. There will also be a test (called topography, pictured below) which shows the anterior surface of your eye (the cornea) which is critical for fitting contacts and Lasix. You will also be tested for anterior surface disease. There will be another machine (retinal camera, pictured below) which can show diabetic retinopathy, high blood pressure, edema and other diseases. Dr. Blumberg will then evaluate these tests. Next, Dr. Blumberg will examine both eyes internally and externally, check eye pressure (glaucoma), look for signs of cataracts, and determine the general health of your eyes. You will also take our easy “Which One is Better 1 or 2” evaluation to help the doctor determine if there is a need for eyeglasses. After your Exam is finished you will be taken back to our showroom area where you will be able to select from our large collection of quality eyeglass frames or if you prefer you may also choose from our large selection of contact lenses. We recommend an annual visit to our offices so we may check for any changes in your vision and to help you keep your eyes healthy and disease free. 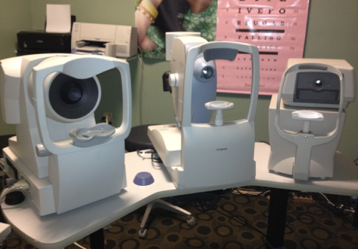 Part of the mission is to provide our patients with the most advanced technology available in the eye care industry. As new technologies emerge, we seek to reinvest in these breakthroughs in an effort to provide our patients with the highest quality level of care and service they deserve. With our community’s eye health in mind, we have carefully selected each state of the art piece of equipment in our office. 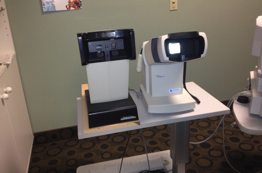 An example of just one of our many effective and practical technology solutions is the ATLAS Corneal Topography System. The ATLAS System delivers the clinical accuracy essential to today’s eye care practice.